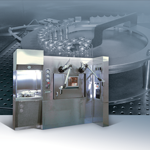 The SPECT Dispensing Hot Cell consists of a large cell with 2 working areas for bulk preparation, calibration, dispensing and labelling: all operations are carried out using master-slave manipulators. The dispensing operations are managed by the Comecer automatic machine, able to fill up to 100 vials per batch. The empty vials are transferred into the cell through an external laminar flow hood, by means of a rotating platform, while the final product vials can be sterilized using a shielded autoclave, located on the right side of the equipment. After the sterilization cycle the vials are discharged one by one inside a shielded lead container.